How many backups should I keep and how often should I backup? In general you should keep a daily backup for each day of business, plus a weekly backup, plus monthly backups for a minimum of 6 months. This is of course dependent on how many transactions you perform each day and how much administrative and management work (word processing, bookkeeping, documentation, etc) has changed on the computer each day. But the rule still generally applies. 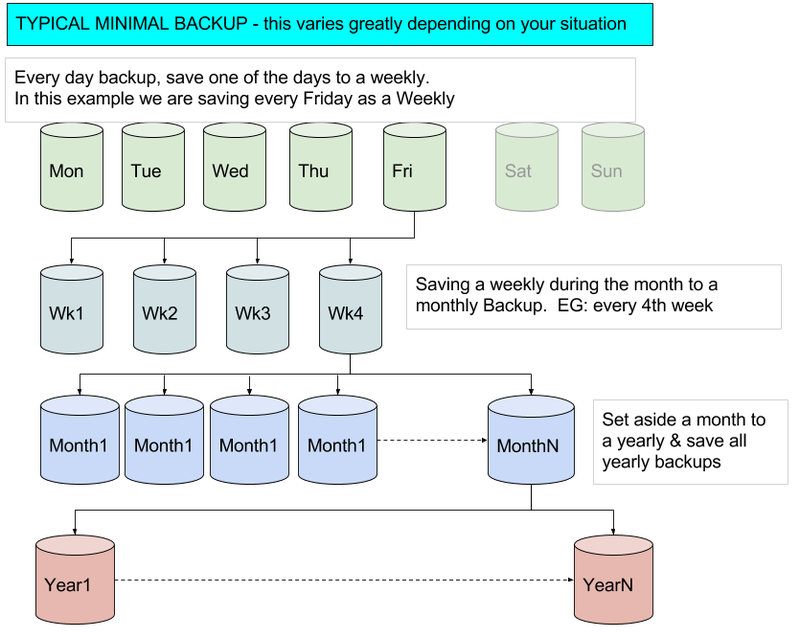 Monthly backup (you would have a minimum of 6 monthly backups) and would use this backup instead of any other backup on the last business day of the month. * Companies that have huge transaction volumes will usually backup more often and in different methods. Why so many daily, weekly, monthly backups? A frequent reason is that the need to restore something from backup is not just because it's missing, but because files are missing or corrupt. So the question is - how long has it been corrupt? A day, well then that's easy isn't it. Wait, maybe it was a couple of days, or was that a couple of weeks? If you haven't used this spreadsheet in 2 months then you need to go back 2 months or more!. Many businesses We've helped have refused to accept this point but most unfortunately have felt this pain. What is offsite storage and why do I need it? Offsite storage is any place off the premises of your business. When we say off the premises we mean out of the same physical building that you're business is located in. Actually it should not even be in the same city block as your business. This is one of many reasons that organizations are turning to using the cloud for the backup storage. Some other considerations - do you know what to do with your backup tape that you brought home with you if your office did suffer a disaster such as a fire. Remember your plan better have a way of retrieving your backup data! What is the proper procedure/method for backups? You stick a tape in and the software that your cousin's friend the computer genius setup runs, backs up your whole network over night and spits the tape out the next day. Everything's ok right! Did it actually back up everything? Believe it or not, this is one of the greatest points of failure I've seen. Companies go to use the backup and there's nothing there! Not a thing! But the backup software shows it working just fine - even verifying - What happened? Lots of things that don't help you one bit when you need that backup. So what do you do? Every 3 months you create a junk file on your computer. A word processing file called backuptest and you try to restore that file from a backup tape. That's it. BE CAREFUL - doing this wrong can result in over writing ALL your files - make sure you know how to restore a file properly. After all, you'll want to know how to do this anyway when you need to. This should only take you anywhere from 15 minutes to 1 hour to accomplish.